Hooch Events & Fresh Jive 07 Presents…. 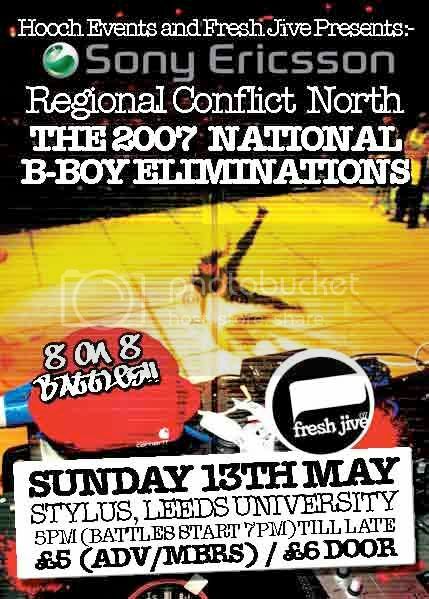 Fresh Jive 07 will host the Northern Heat of The UK National B-Boy Eliminations 2007, on Sunday May 13th. 8 Northern Crews, will be battling in 8 on 8 battles, with the winning crew and runners up, going through to the Sony Ericsson National Final in London, on July 14th 2007 and in with a chance to represent the UK in the World Finals. The Sony Ericsson B-Boy Championships - World Finals is one of the worlds greatest Hip-Hop events, with national qualifiers around the world. The event features the best solo breakers, poppers, lockers and b-boy crews from across the globe. It also plays host to some of the most exciting Hip-Hop artists to visit the UK. The Championships is easily the most eagerly anticipated event in the Hip-Hop calendar. http://www.freshjive07.com	for Fresh Jives brand spanking new website!! !